You'd expect some that was beat up to be black and blue. You'll have to expect something in black and blue from the Margiela camp to be mysteriously pristine. Well that is what you have with their new Metallic Blue/Black Lace-up Shoe for their Line 22. 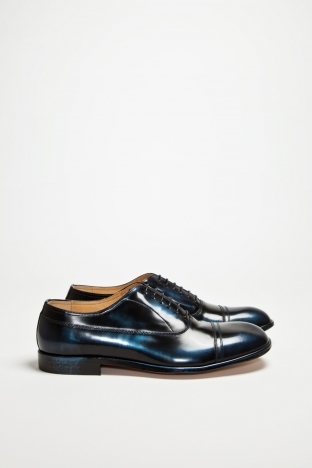 It's an amazingly soft calf leather that's have the glimmer of metallic with the dual tones of blue and black making for an attractive shoe that works perfectly with black and/or navy. Available now at TresBienShop.com wit h20% off for non EU customers.